INDUSTRY.co.id - Probolinggo - Chairman of the Society of Petambak Garam (HMPG) Probolinggo, Buhar, said the phenomenon of gending wind in Probolinggo regency, East Java, helps to optimize the production of salt in the local area. 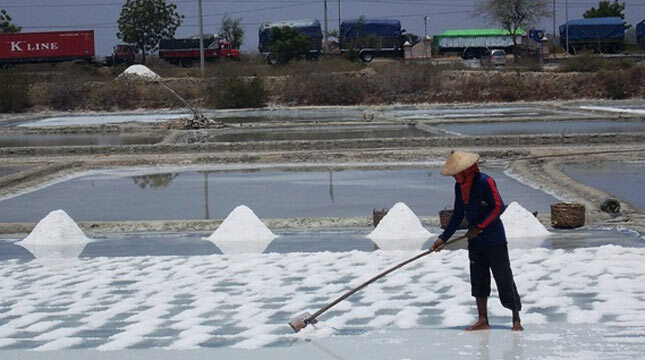 "Gending wind phenomenon is not always bad, for example in the field of salt aquaculture because with the wind is precisely the field of business was helped from the production side," he said in Probolinggo, Monday (9/7/2018). According to him, the phenomenon of gising wind is an annual phenomenon in Probolinggo regency, namely wind that blows from south to north, or toward the sea. "The gending wind sometimes brings excellent heat for salt production, and salt culture must be sustained by four elements: sea water as raw material, soil as a place of production, sun and wind to accelerate the crystallization process," he said. He explained that the dry season that has arrived and plus a good wind, the process of salt production faster and this year wind gising has started to emerge since a week ago. "A month ago, we harvested the prime of salt, but with production of about 3-4 tones per plot of land, after which the wet (wet) rainy season caused salt production to stop," he said. Currently, he continued, the land of salt harvest again and two plots of land to produce about 10 tons of salt and it hopes there is no more rain fall in the dry season, so that the salt production of farmers can be maximized. While Head of Probolinggo District Fishery Office Dedy Isfandi said the phenomenon of gising wind is a typical phenomenon of coastal areas in Probolinggo regency. "The wind blows from the District of Tongas to Klaseman Village, Gending District which the period of the emergence of the wind ranged from June to October," he said.